Electron microscopes are expensive, large instruments and require careful installation and regular maintenance. The performances of specific instruments vary from model to model and manufacturer to manufacturer even though they are trying to match each other due to market competition. Because of the complexity of the instruments and the phenomena related to materials and interaction between energetic electrons and materials, it is a process of years rather than weeks or months to become a proficient electron microscpist. i) Low and high (and ultra-high for some analytical EMs) vacuum pumps. ii.a) Accurate power supplies for lenses. ii.b) Accurate power supply for accelerating the electrons towards the specimen. iii) Column itself. It is composed of a series of electromagnetic lenses stacked on top of one another. Both electron microscopes (EMs) and ion microscopes (IMs) mostly use similar magnetic lenses. Different signals can be generated by the interaction of the incident beams with materials in various microscopes. These signals are transmission electrons (TE), backscattered electrons (BSE), secondary electrons (SE), Auger electrons, X-ray, electron energy loss spectroscopy (EELS) and so on. Those signals can be used to reveal the crystalline structure and analyze the topographic and compositional characteristics of the specimens. Two main types of electron microscopes, scanning electron microscope (SEM) and transmission electron microscope (TEM) have been used for microstructural examination in nearly all disciplines of science and engineering. The resolving power of electron microscopes is about three orders of magnitude greater than light optical microscopes. Comparison between TEM and SEM has been given by Table 4997. The performance of most microscopes is significantly determined by the objective lens as this usually has the largest product of field of view and the largest angle of any lens in the column. Ideally, an electron microscope can be simplified as a contrast transfer function (CTF). Many parts in EMs have not been improved in many years except the aberration correctors are introduced recently. For instance, in TEM systems, the sample stages, electron guns, round lenses, objective lens (OL) polepieces, and detectors available in current systems are very similar to the best available in 1980s, e.g. shown in Figure 4562. Figure 4562. 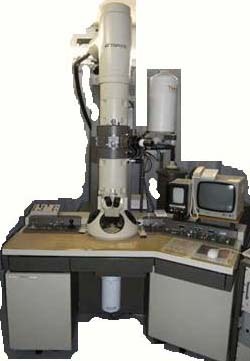 TEM Topcon 002B, introduced in 1986. An important limitation of both EM and IM techniques is that gases cannot be analyzed and liquids are limited to those that have very limited volatility and will not contaminate the column and specimen chamber because specimens must be exposed to vacuum conditions.